Beautiful mirror box, perfect for producing and vanishing silks, small animals, and other props! The box is opened showing it is empty. It is given one full revolution. The top door is then opened and the performer makes an object appear! 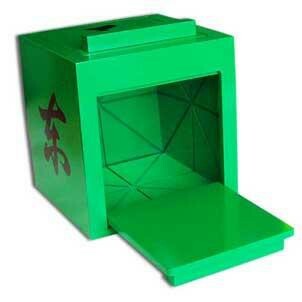 The Mandarin Mirror Box comes in three colors, red, yellow, and green. The box measures 5.9 x 5.7 x 5.5 inches (15 x 14.4 x 14 cm). The doors measure 4.5 x 4.5 inches (11.4 x 11.4 cm).